Winter Trends: Gold | Petite Plus, Meow! Here we go – Post #2 in our December long series!!! PPMeow! has teamed-up with StyleCassentials to bring you another collaboration featuring some of the Winter Trends for 2016 Holiday Season!!! Buuuuut its out of stock or “coming soon”. And your heart breaks and continues to yearn for that coveted piece? 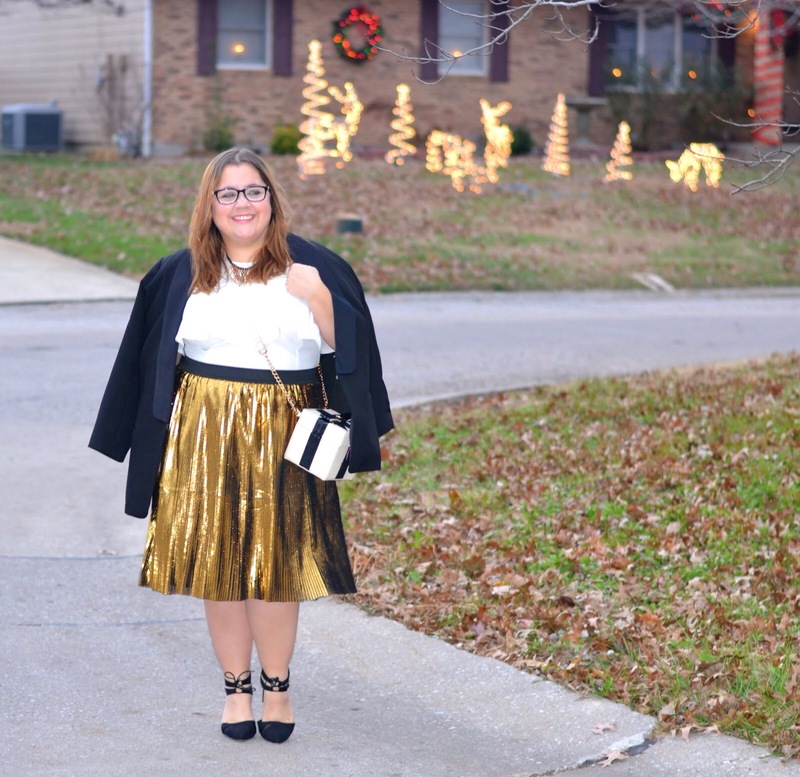 Yah…well that was exactly what happened when I met the Sequin Bonded Pique Dress by Eloquii. So, I put my name on their waiting list …. And then one fateful day, it arrived at my door. Wheeee!! This sculpted skirt styled with a flash of gold sequins along the skirt just adds the WOW factor to this oh-so comfortable to wear, with its fit and flare nature. If this dress is “Red Carpet refinement” – as it was seen worn by gold medalist Michelle Carter to the 68th Emmy Awards – then it certainly was gonna turn some heads at a Company Holiday Party!! Cassie is just screaming holiday ready in this outfit!!! 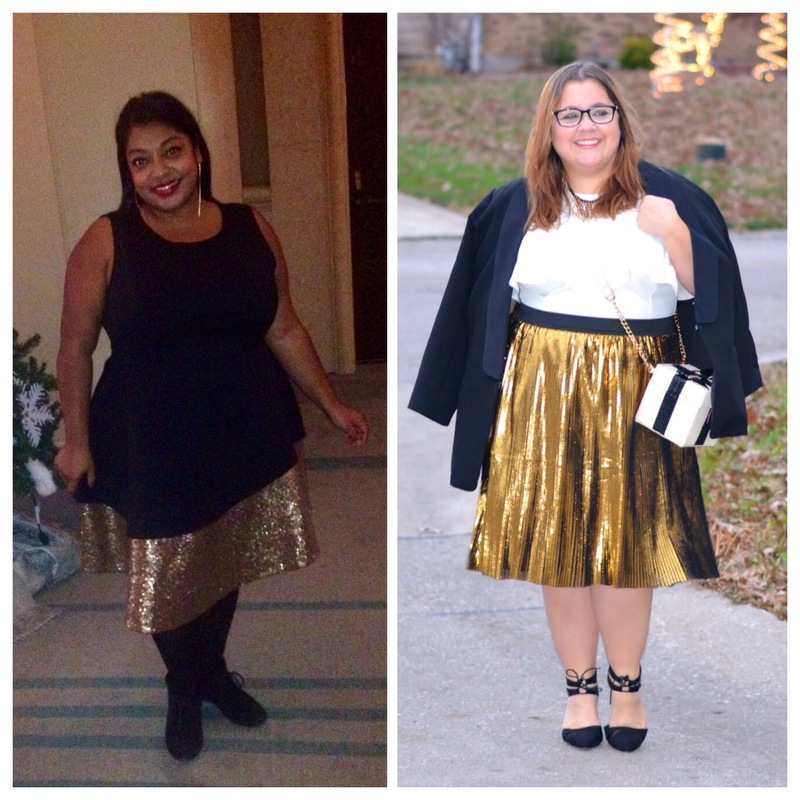 Head over to Style Cassentials for all the details on her take on this Winter Trend: Gold. Or her Instagram here. Or visit her Facebook page here. Have you tried Eloquii’s petites? BOTH Cassie and I are rocking pieces from their petite line … you gotta check them out friends! Stay tuned every THURSDAY, all December long, to see how we’ve put our own unique twists on popular Winter Trends this year. We hope they bring you some fashion inspiration to try yourself this month! Last week’s post was about incorporating FUR into your Winter party wardrobe …. click here in case you missed it. Do you have a favourite yet? Tell us in the comments below! Pingback: Winter Trends: Sparkle | Petite Plus, Meow! Pingback: Winter Trends: Velvet | Petite Plus, Meow!